From starkparks.com, "Road construction at Walnut Rd. has closed the north side of the road. Trail users can use the South side of the bridge and road to connect to the Sippo Valley Trail and Towpath Trail in Oak Knoll Park." Facilities: At both ends of the trail in Dalton and Massillon. 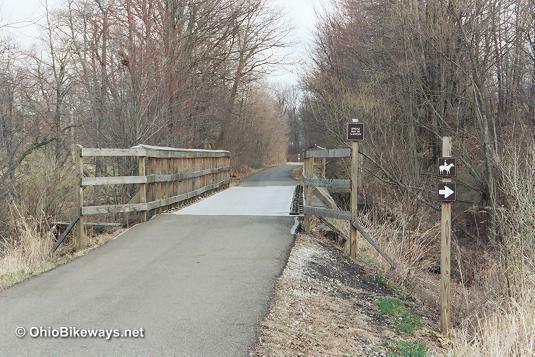 Worth Noting: The Sippo Trail connects with the Ohio & Erie Towpath Trail in Massillon. We started out just west of Dalton and rode into town to Village Green Park where the trail officially starts. It begins in front of the restroom facility and works its way around the large parking area before exiting the park. Aa you leave the park and cross East Main Street, the trail becomes a wide bike lane along Freet Street until the street ends. There the path begins and turns right and makes its way around a commercial site before heading off into rural countryside. Trail signs along the Sippo are quite good. Horses are allowed, but buggies are prohibited from using the trail. Road names are posted at crossings and a small sign informs you that you're on your way to Massillon as you leave Dalton. The trail soon straightens as a creek makes its way alongside. Foot paths that connect with neighborhood streets attest to the popularity of this pathway with local residents. We passed a number of folks on the trail during our visit. There are mile marker posts every 1/2 mile. At Deerfield Road, about 2.8 miles from Dalton, the trail turns to gravel. An asphalt surface picks up again around the 7.8 mile point and takes you into Massillon. The Sippo Trail is mostly flat, but you will encounter a short, steep climb up to 17th Street in Massillon, before descending into Lincoln Park. Where the trail reaches Bottoms Park in Massillon, it nears its end. If you're turning around to ride back, you're good to go. But if you prefer riding on to the Ohio & Erie Towpath Trail, you'll need to consult the trail map. Your preferred direction of travel (north or south) on the towpath will determine where you exit the Sippo Valley Trail here. A little road riding (~.5 mile) is required for southbound riders. While less road travel is necessary to go north as you take to the sidewalk to make that junction on the Lincoln Way West Bridge. Mile markers on the Sippo Valley Trail count down to "0" at trail's end in Massillon, while mile markers on the towpath count down to "0" at Lake Erie. This bikeway uses bollards at road crossings. Solid bollards on the trail surface are a known hazard to trail users that have caused serious injury and death. Visitors should be aware of this danger. And local trail users are encouraged to learn more about this safety threat in your community. Read the trail bollard hazard blog series.